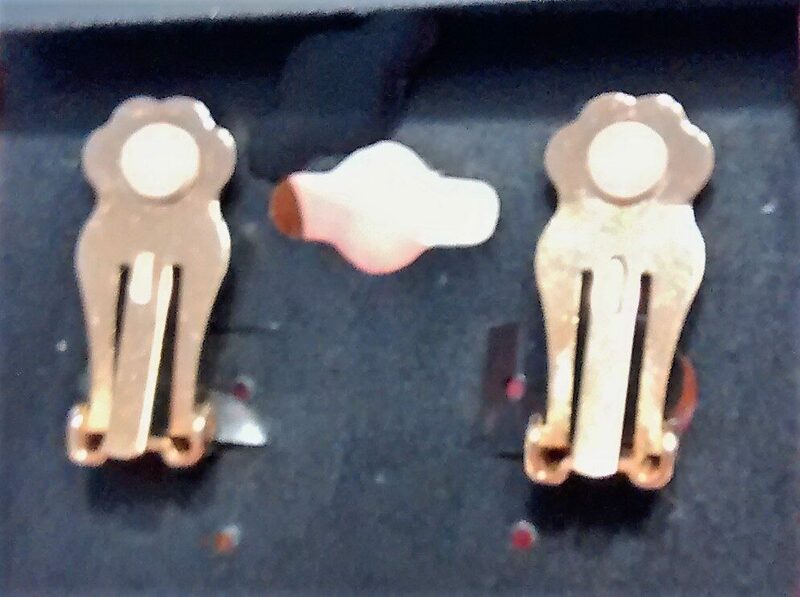 All jewelry has been inspected and cleaned. 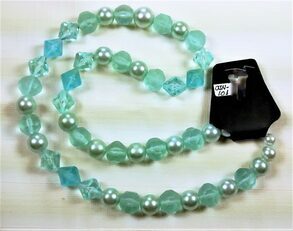 This is a vintage necklace- Icy Pastels in aqua from Avon made in 1987. 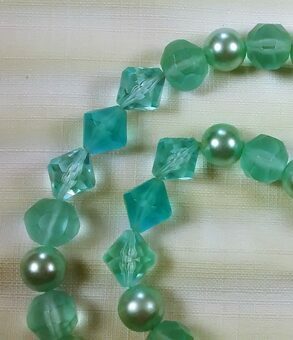 Faceted acrylic beads and glass pearls. Very pretty. Very retro. It will bring back memories. It is 25 inches in length. 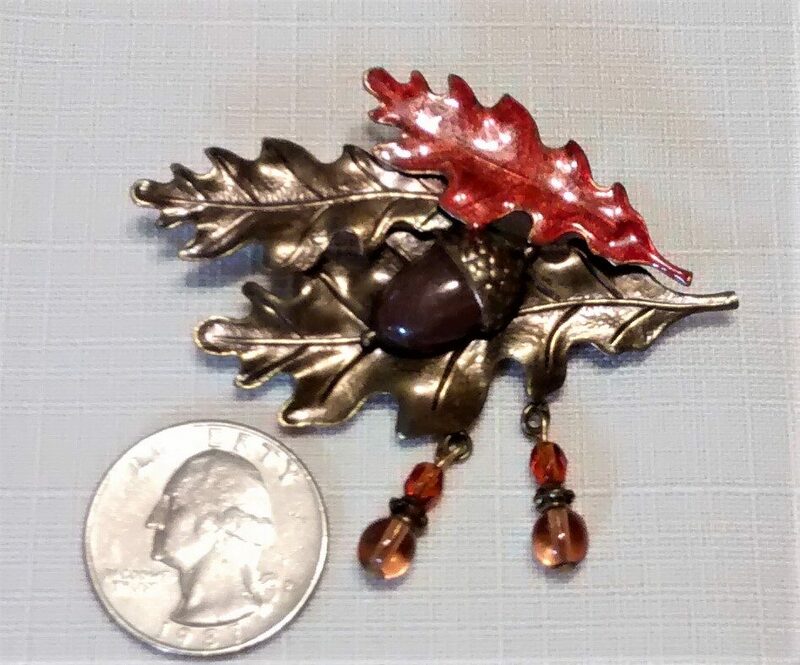 This is a cute, autumn themed brooch/pin. 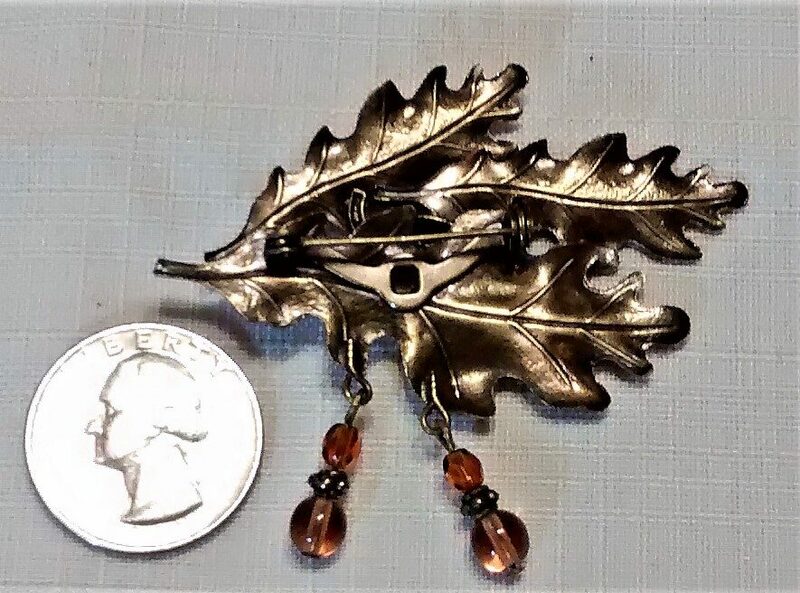 Oak leaves and an acorn. 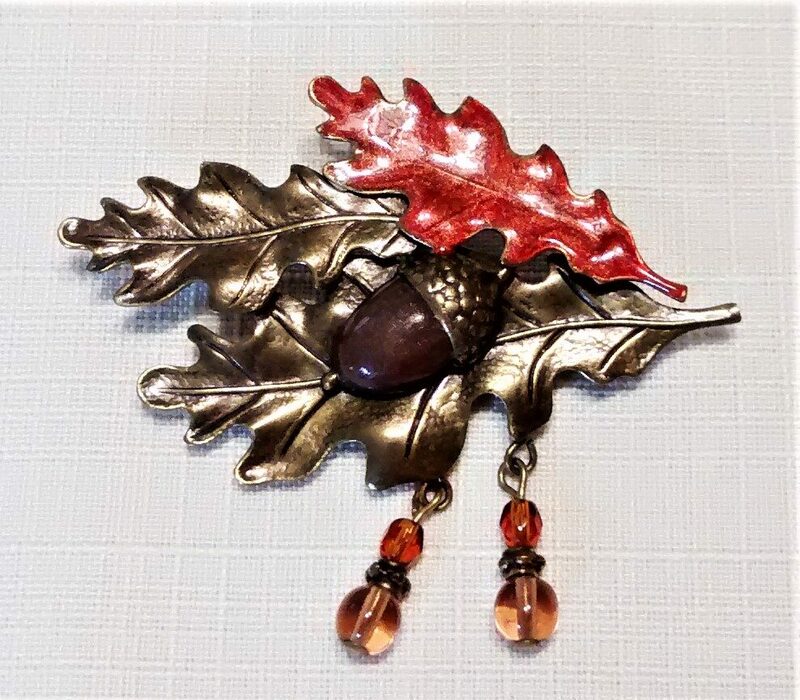 It has two dangles of brown beads and has one leaf accented in a rust color. It is not signed, so I have no idea of the real age or maker. Please consult the pictures that are featured to help you judge the size and look. Approx. 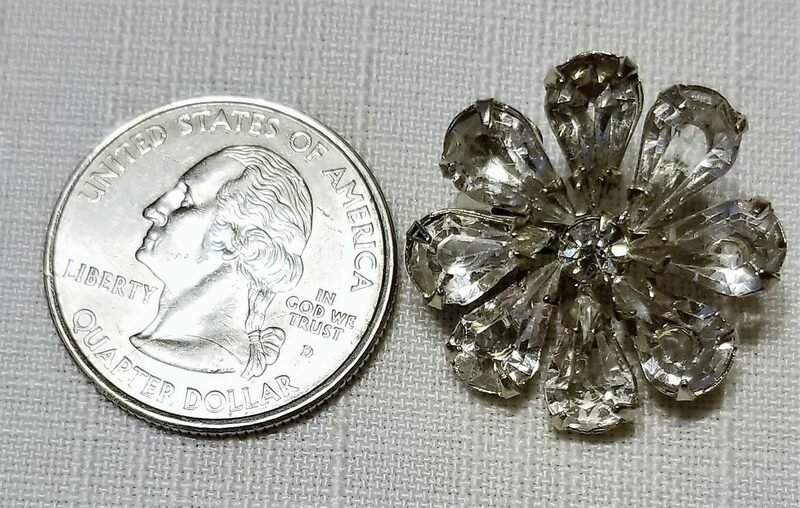 2 1/2 inches in length. 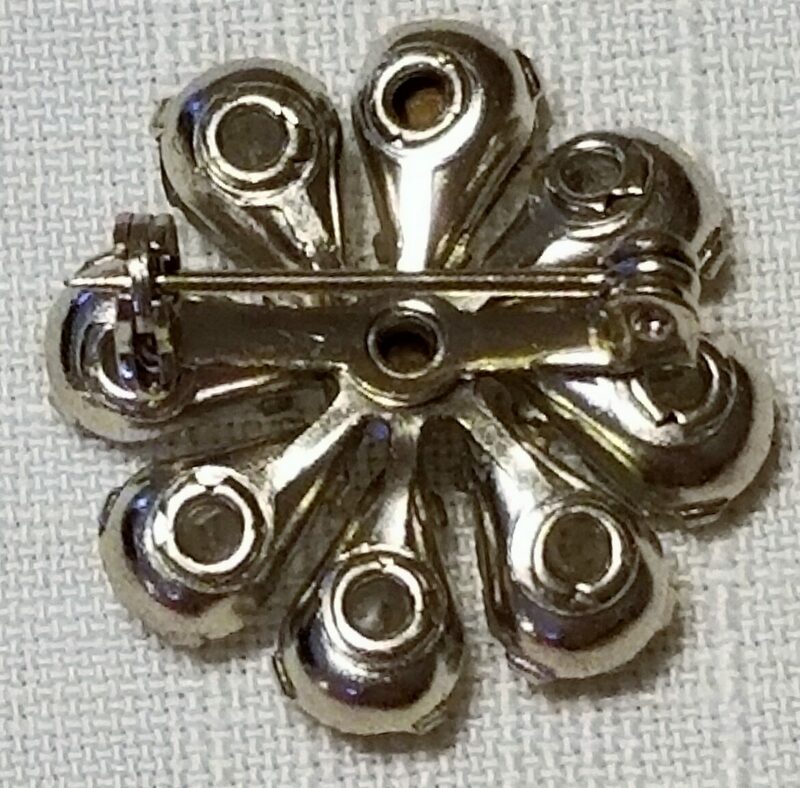 The back of the piece is also shown. There isn't any damage to this that I can see. 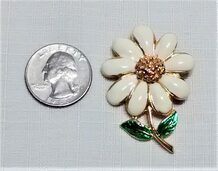 It would certainly look great on a suit jacket or even on a scarf for a dramatic eye-catching look. 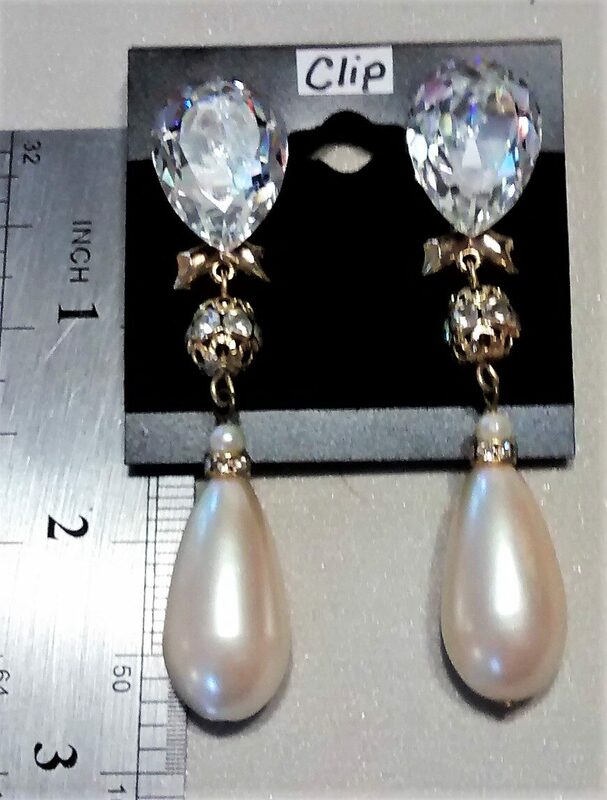 This is a pair of dramatic vintage earrings with pearl drops, large, teardrop crystals, and accented with rhinestones and tiny bows. Very pretty. 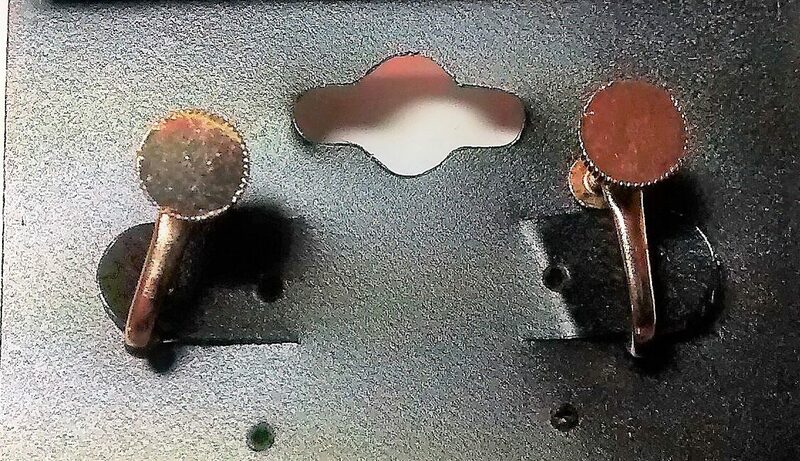 Clip backs. Really make a statement. These are in great condition. 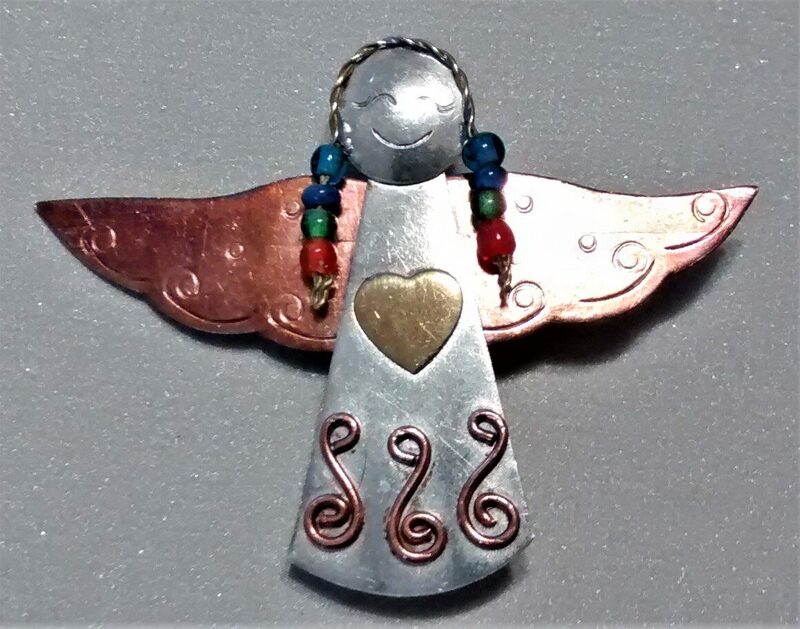 You could also take apart and use the individual elements for other crafts. These are fun! 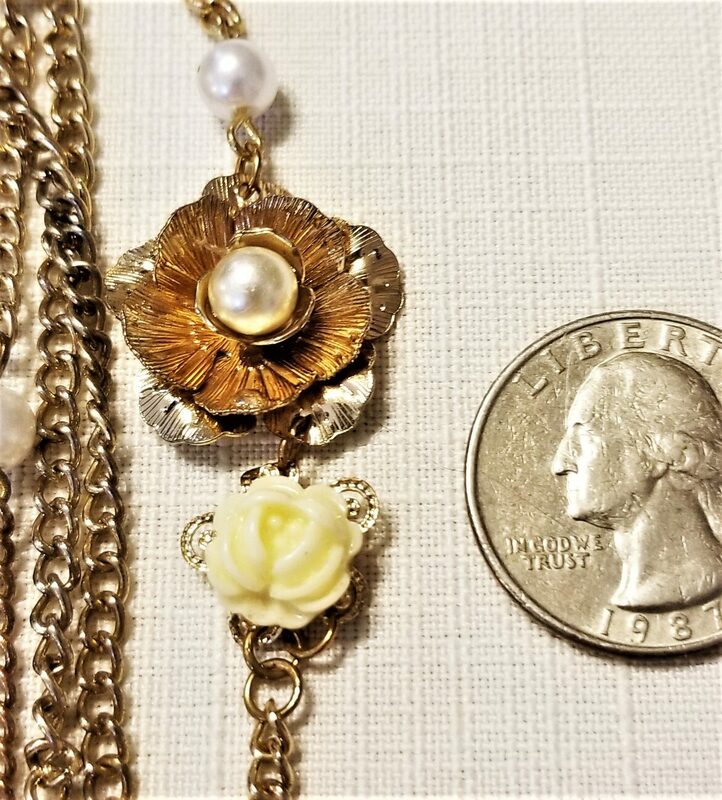 This necklace is gold-tone with assorted flowers, leaves, and pearls. Two strands. 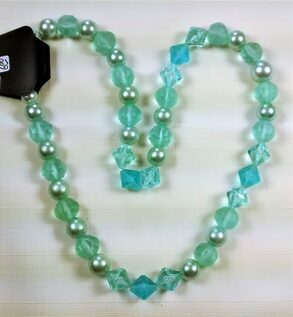 Made by ETC! 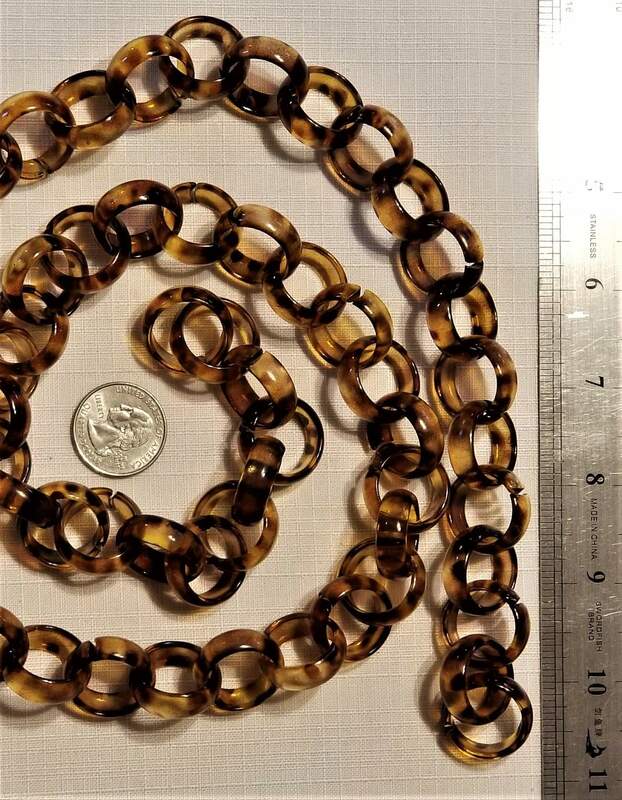 Jewelry Co. 35 inches with a 3 inch extension. Made in Mexico. 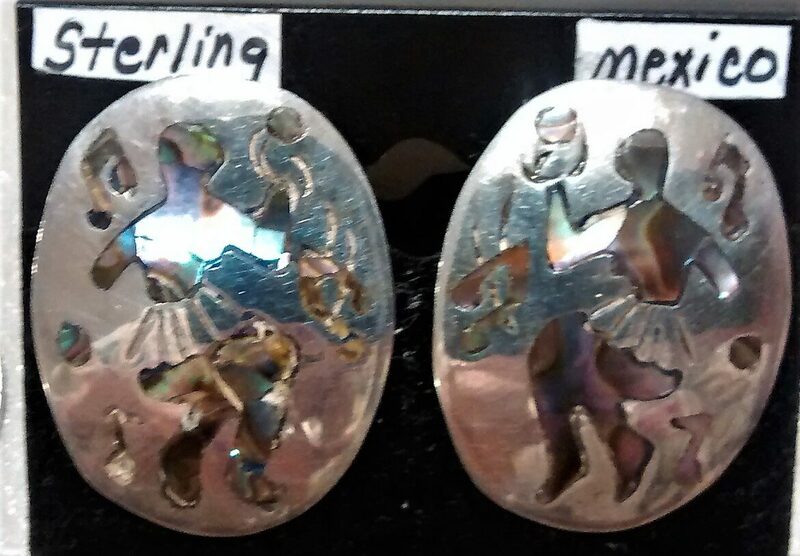 Sterling silver earrings that are enhanced with inset with colorful abalone. They are in great condition. 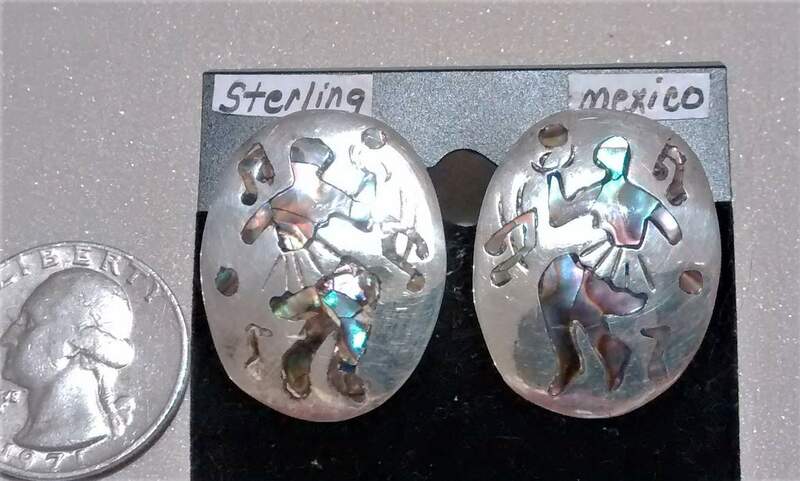 They depict dancers with musical notes and maracas. 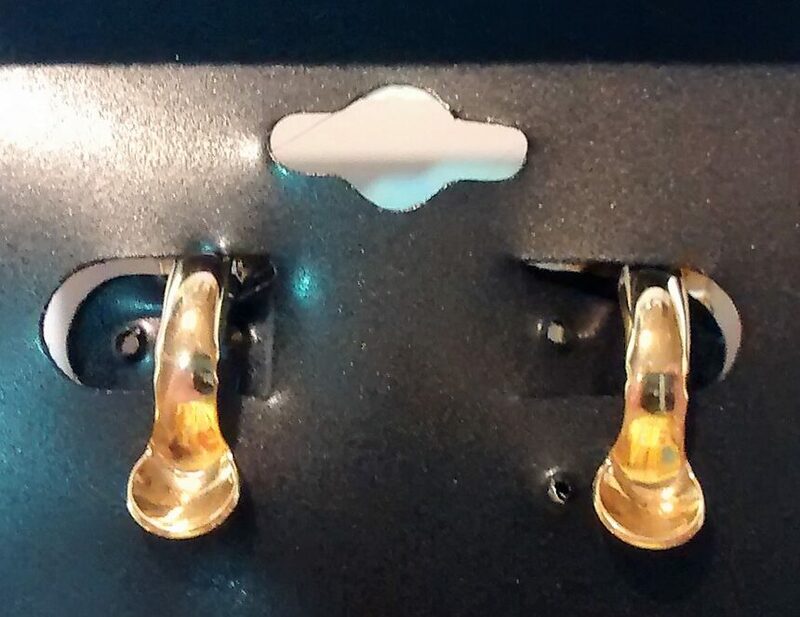 These have screw on backs. Great for a fun night out. 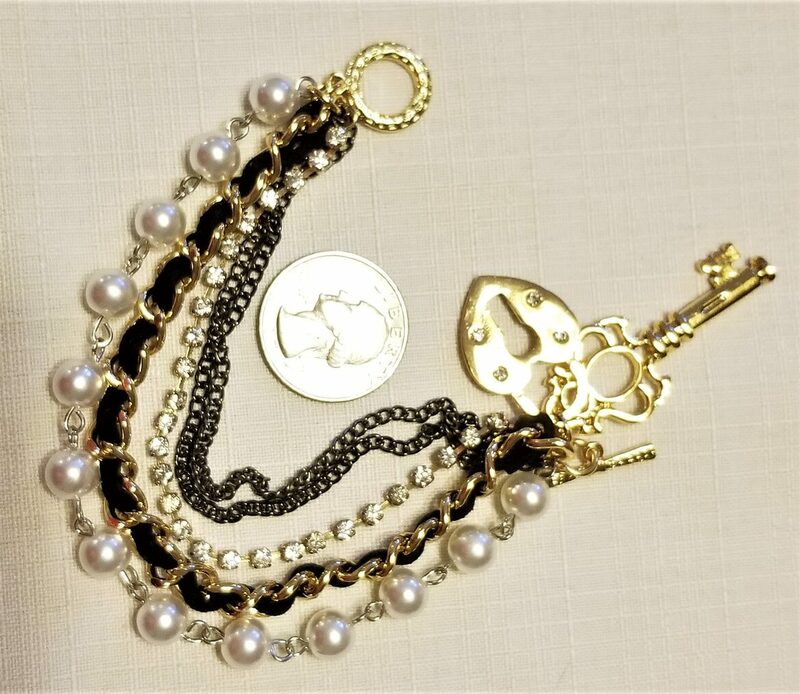 This is a bright, contemporary bracelet of strands of faux pearls, gold and black chain, and rhinestones. 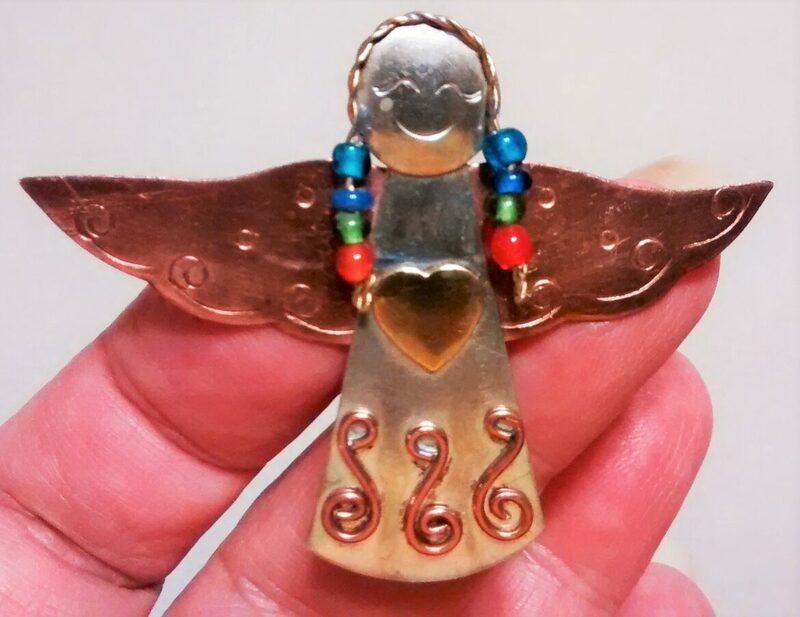 It is accented with a heart shaped lock and a key. 7 1/2 inches in length. Description doesn't do it justice. 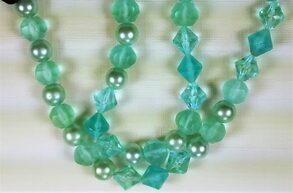 You can wear as it is as a bracelet, take it apart and use it as separate components in your crafting projects, or use it to add to a necklace. 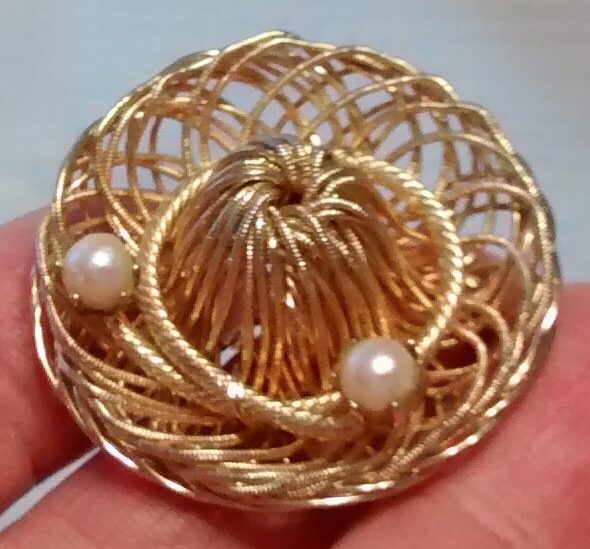 This is a gold wire sombrero brooch/ pin with two pearls as tassels. Fun and gorgeous. 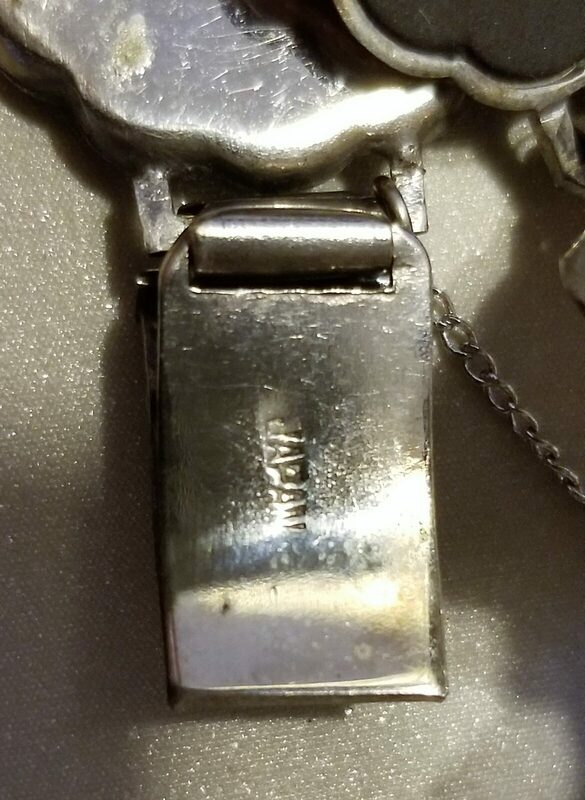 It is not signed, so I have no idea of the real age or maker, but there is another one on the Internet and they mentioned it might be a Weiss. It was similar. Please consult the pictures that are featured to help you judge the size and look. Approx. 1 3/4 inches in diameter. The back of the piece is shown in the second to last picture. 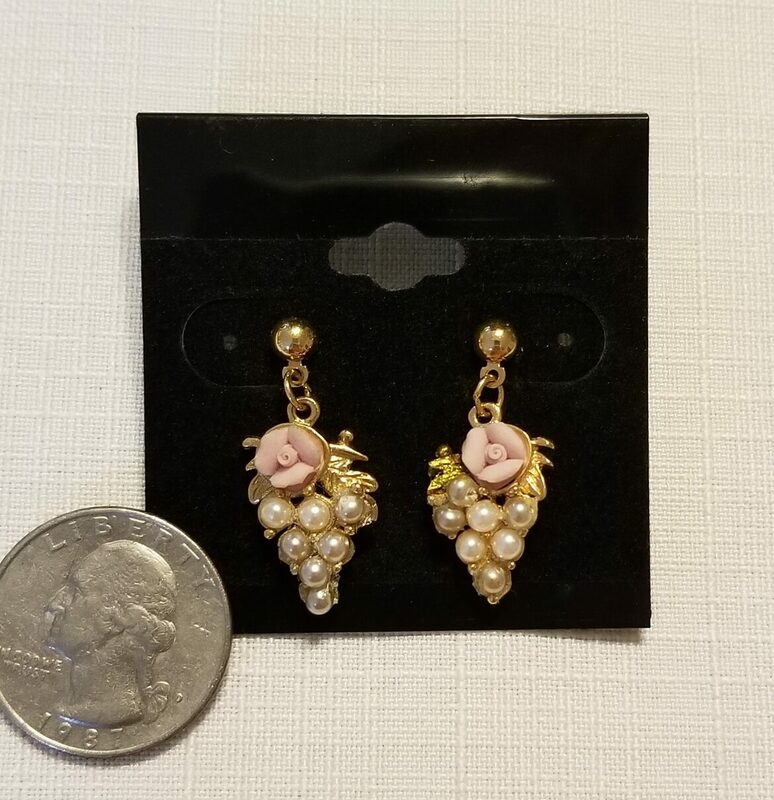 This is a pair of pearl grape clusters with pink ceramic roses that are for pierced ears. Dainty and feminine. 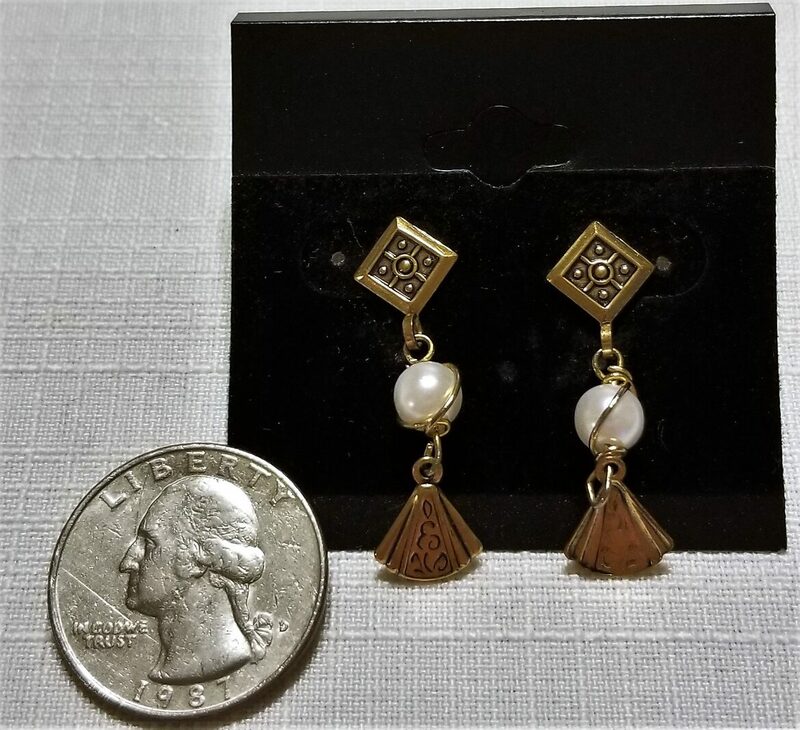 They are stamped Avon, however, I am not sure if some of the pearls have been replaced or they came with the two tone look, so I am not going to price them as Avon. I could not find another example online. I think it actually adds a bit of interest to them. 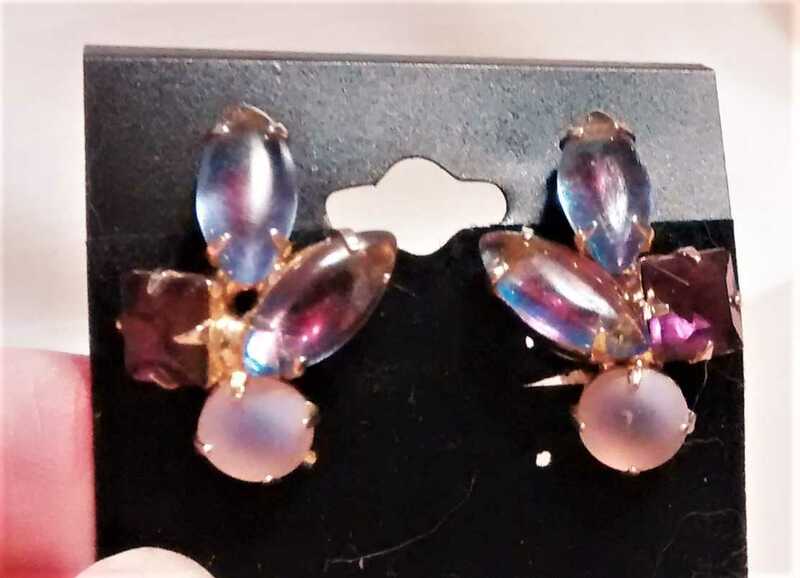 Very pretty and are ready for a dressy occasion. Dimension is 1 1/8" length and 1/2" width. I am again guessing on the age of these. They are in a newer condition. 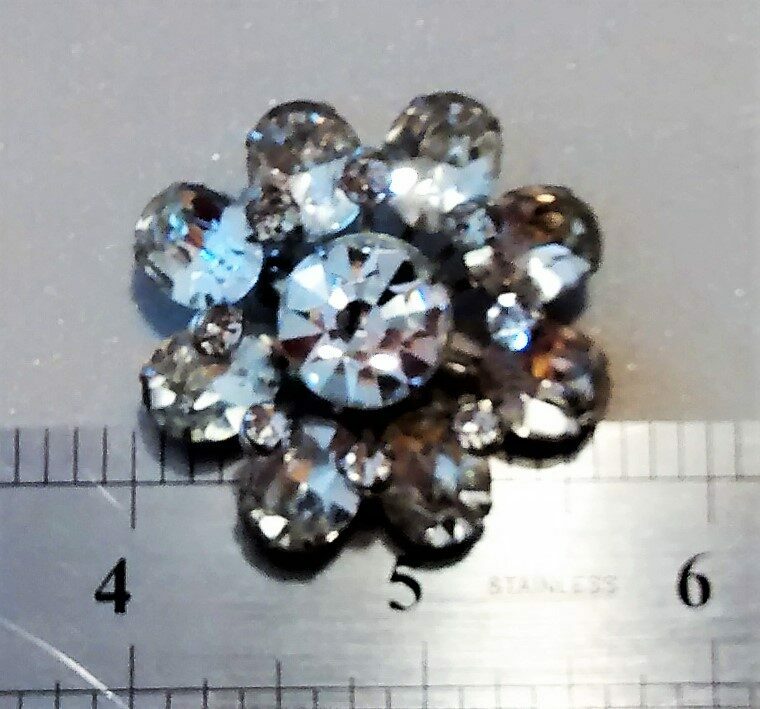 A dainty floral brooch made of rhinestones (cut glass?). 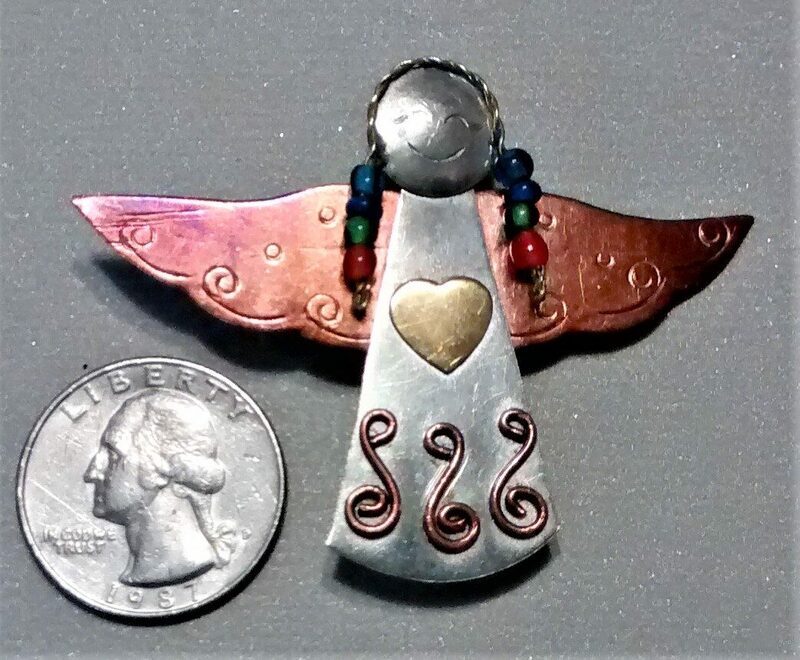 1" in length and 1" in width. 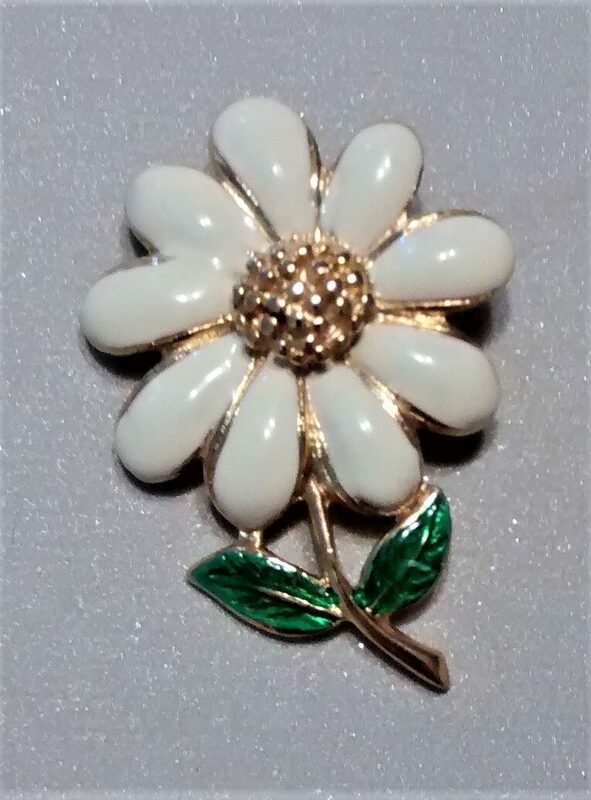 Not sure of the manufactured year, but it looks to be a mid-century brooch. No maker's mark. The back of the piece is shown in the last picture. 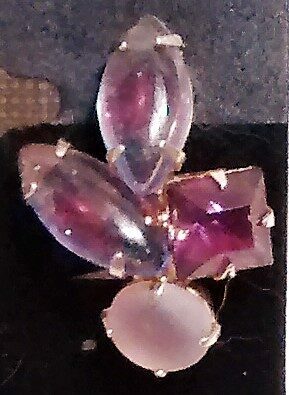 This would look great on a coat or sweater for just a touch of sparkle. Remember, I charge a flat fee of $6.45 no matter how many items are ordered at one time. no matter how many items you order at one time. 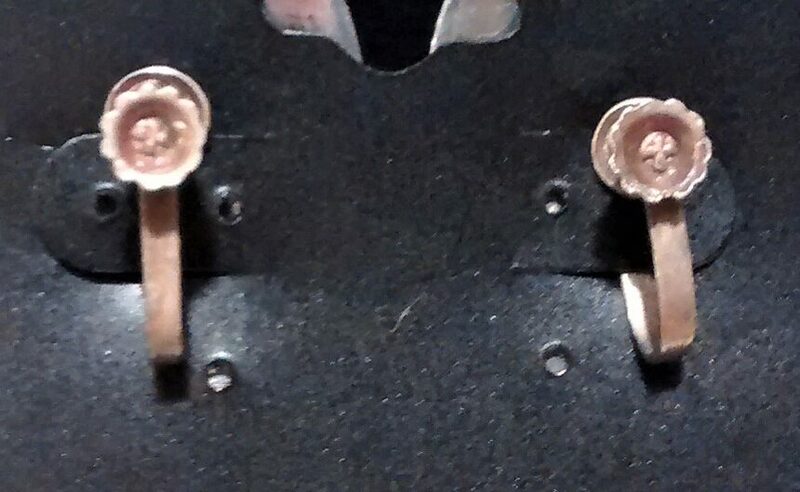 A pair of vintage earrings that are pretty gold hoops that are 5/16" in width and 3/4" in length. Nice quality and well made. 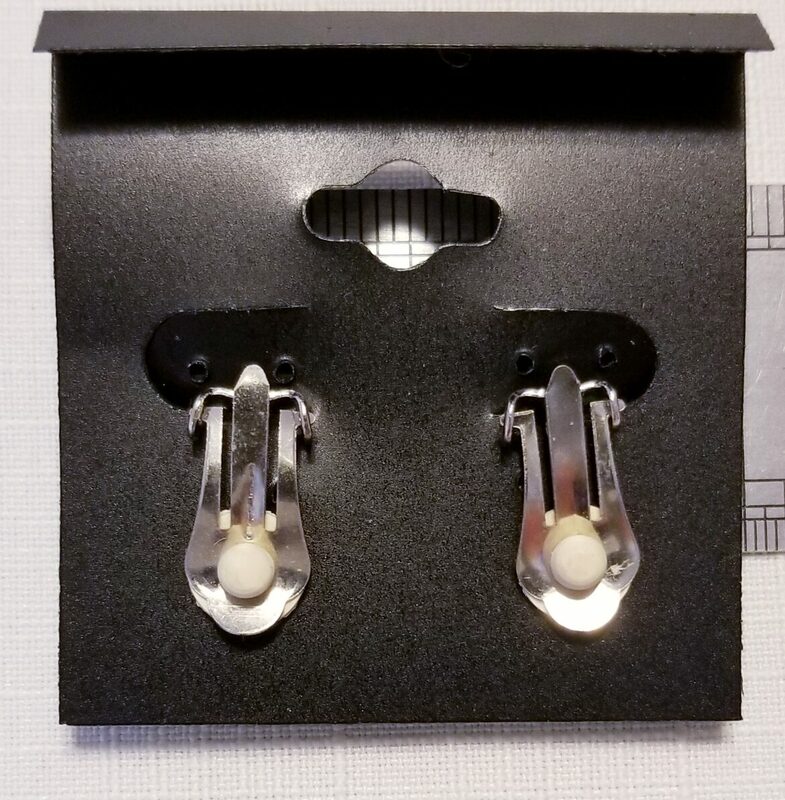 These have clip on backs. 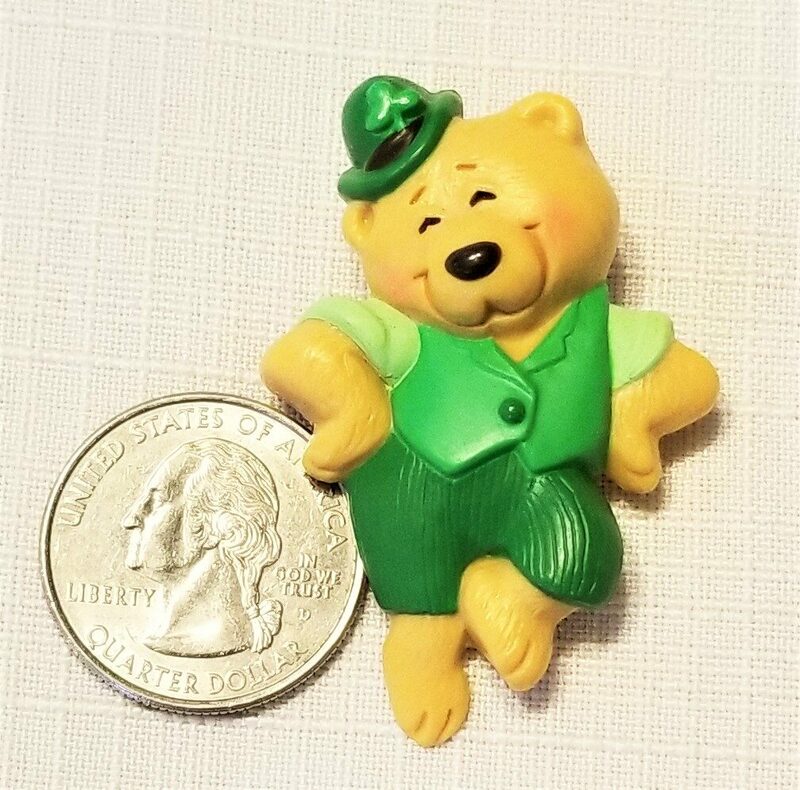 This is a cute, collectible, Hallmark pin from 1986. 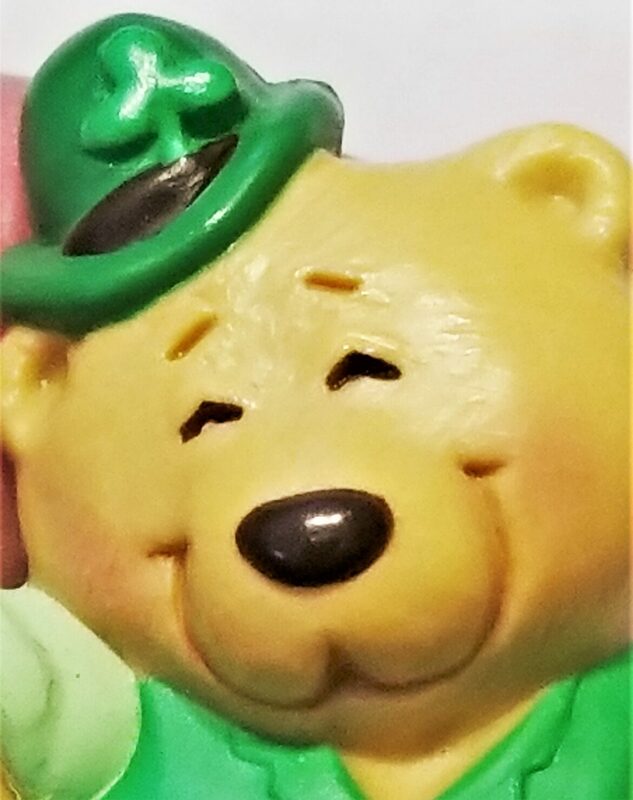 A smiling bear doing a jig. Primarily green colors. 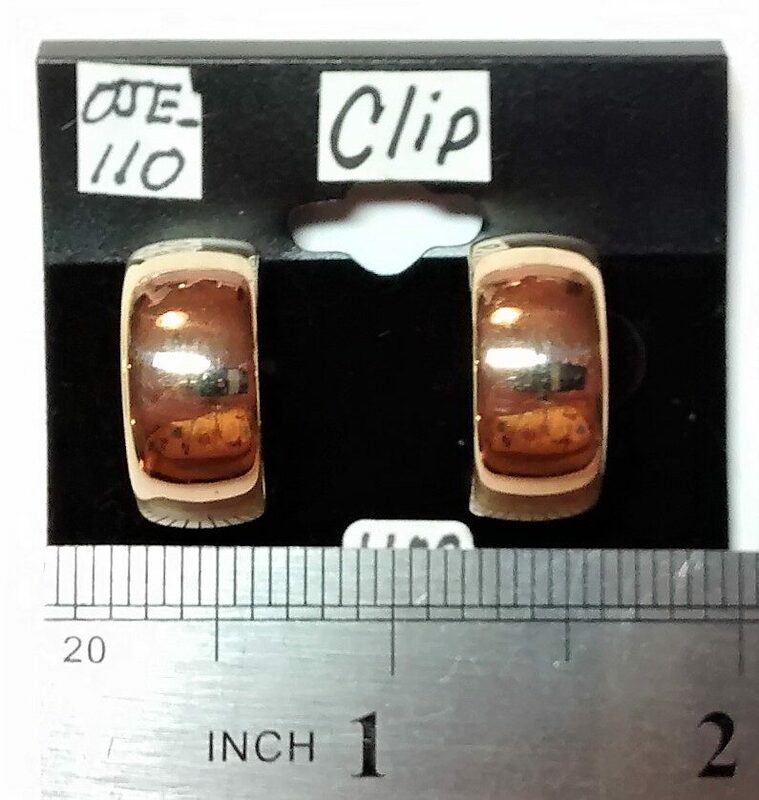 2 inches in length and 1 1/2 inches in width. 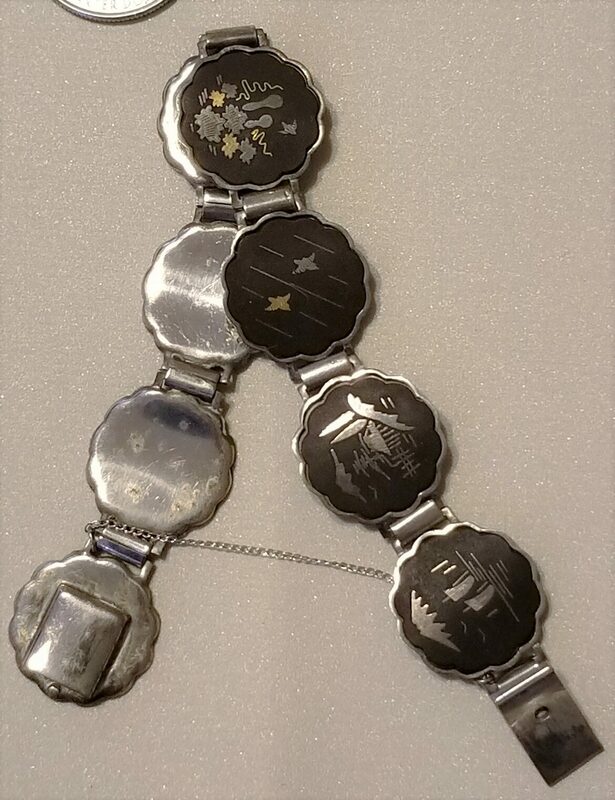 This is a vintage, Damascene, bracelet that is accented with insets of silver and gold on a black background. 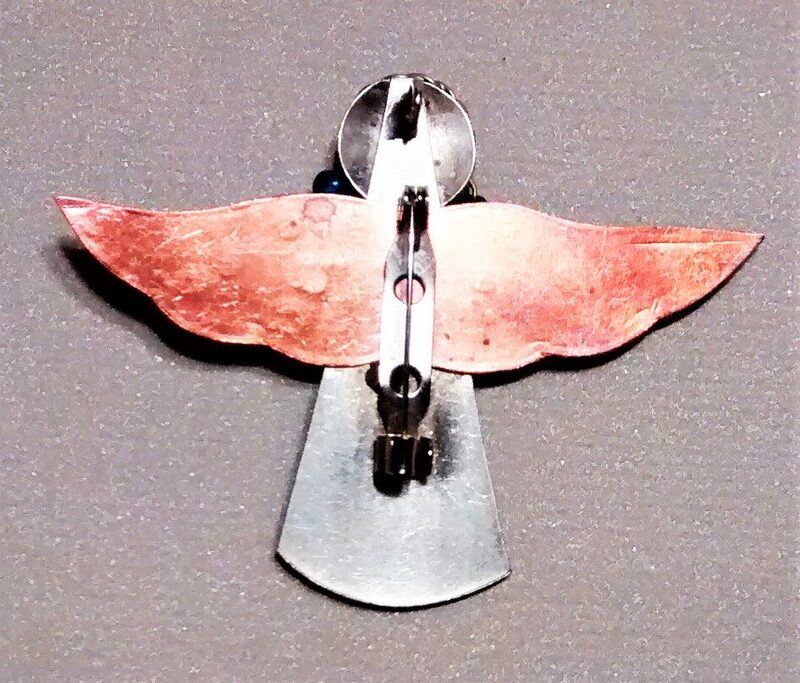 Traditionally, it is made with stainless steel and there is some aging and corrosion on the back. Front looks in great condition. It is made in Japan around the 1930s. 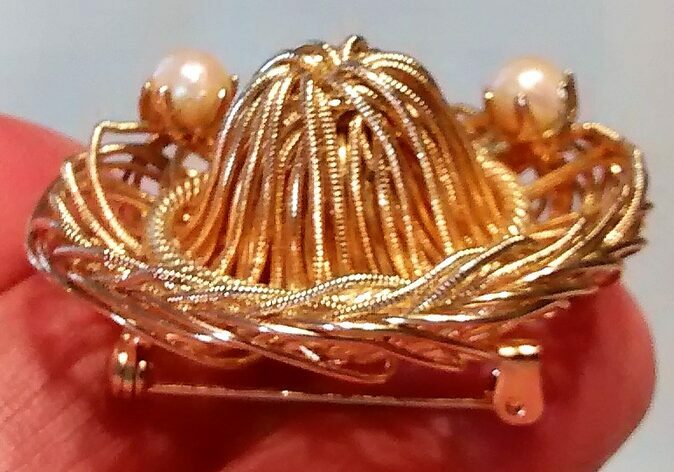 7 1/2 inches in length, with eight individual vignettes. Very pretty. 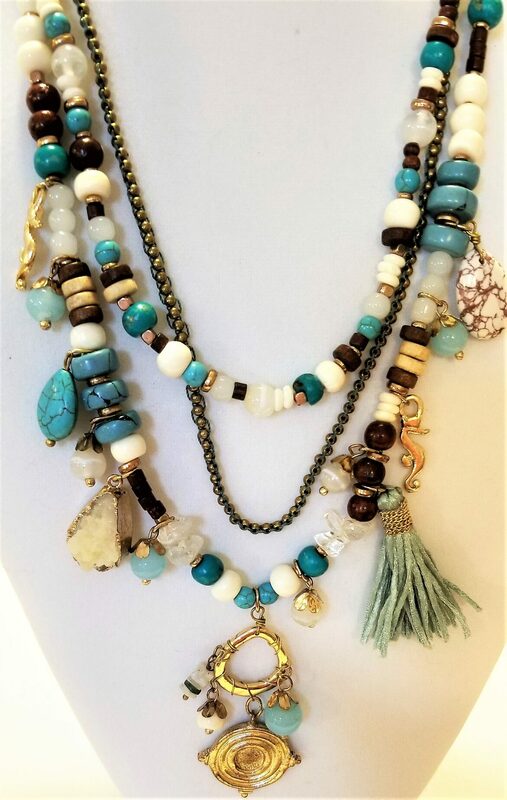 It is a wonderful statement piece that will bring compliments! even on a scarf for an eye-catching look. 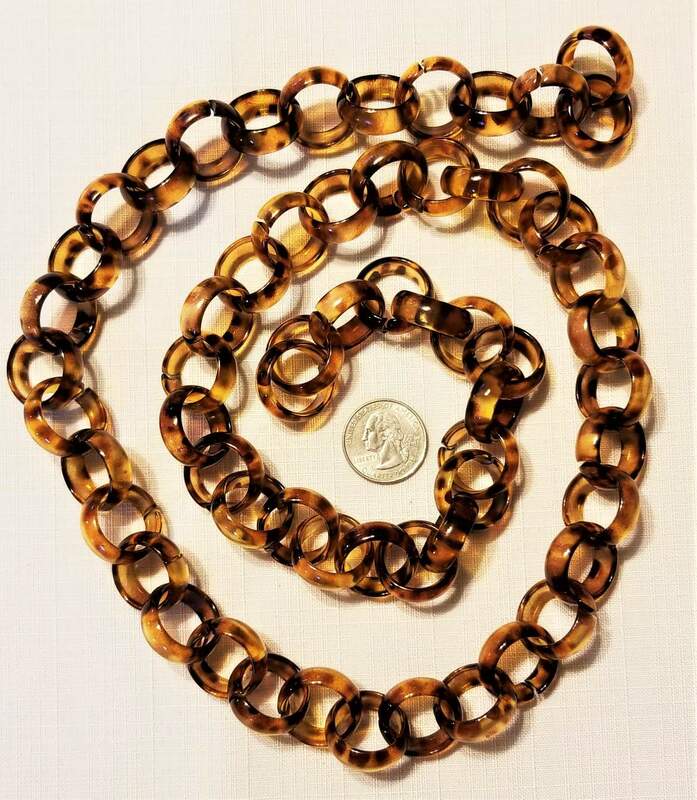 This is a multi-strand necklace made by Chicos. 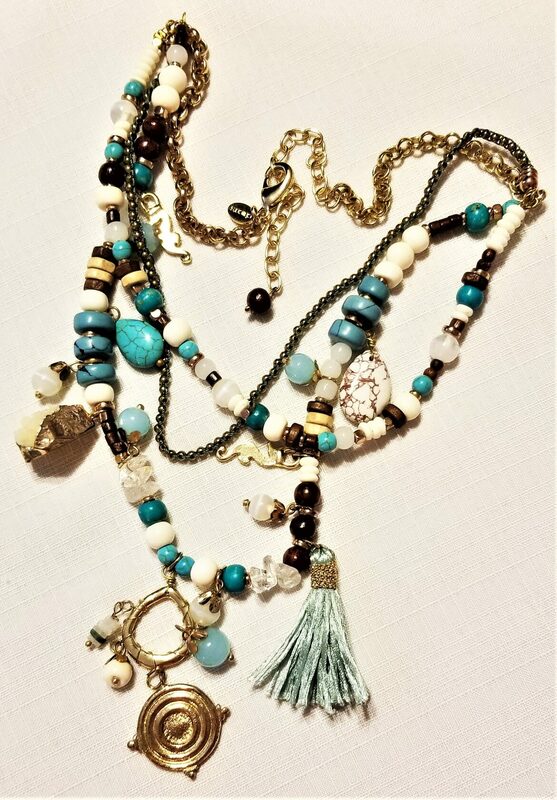 Turquoise, cream, and brown beads accented with gold drops, stones, and a tassel. I have no idea of age. 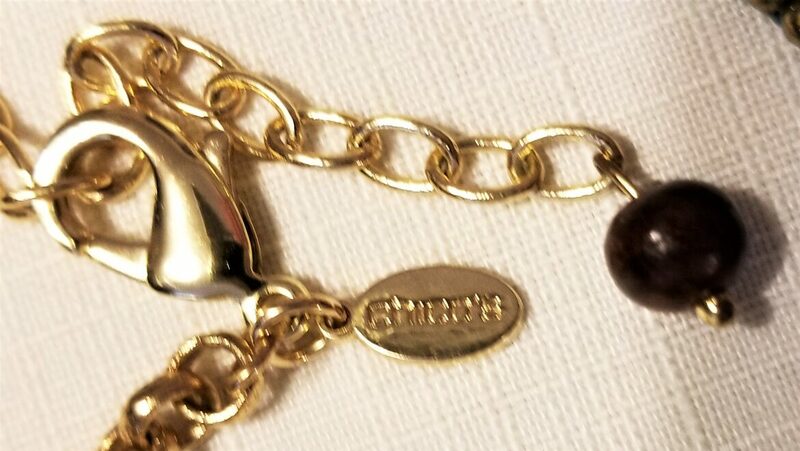 It may be an older Chico necklace. It looks to be in new condition. 26 inches in length with a extension of 4 1/2 inches. 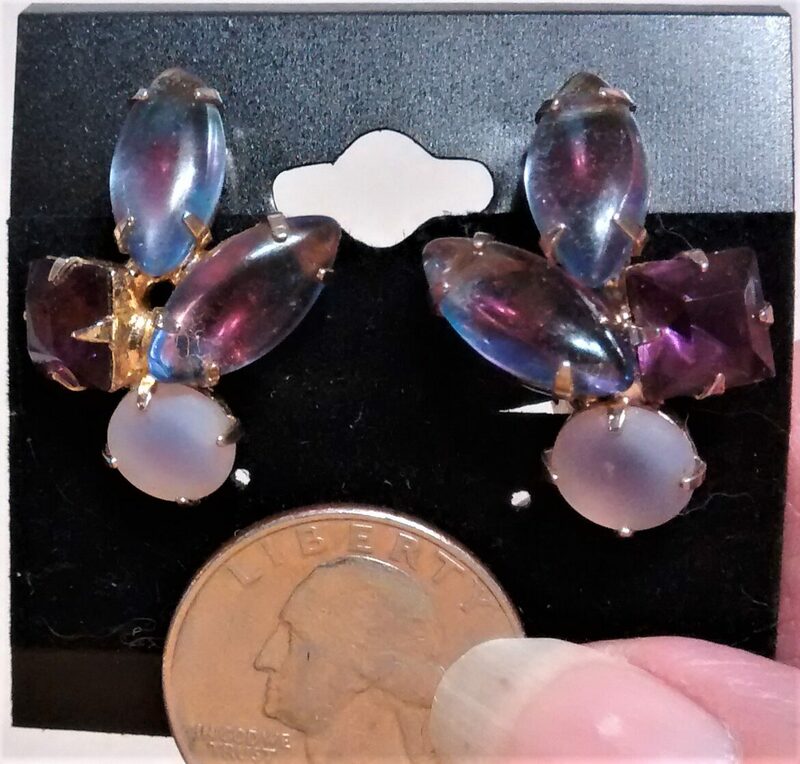 This is a pair of clip-on vintage earrings with iridescent, faceted, and frosted, purple and pink glass cabochons. 1 1/8" in length. 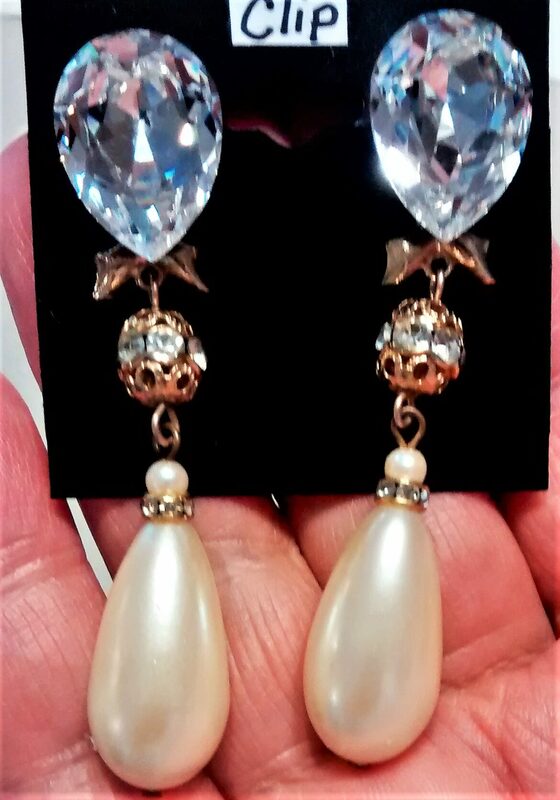 Very pretty and are ready for a dressy occasion. 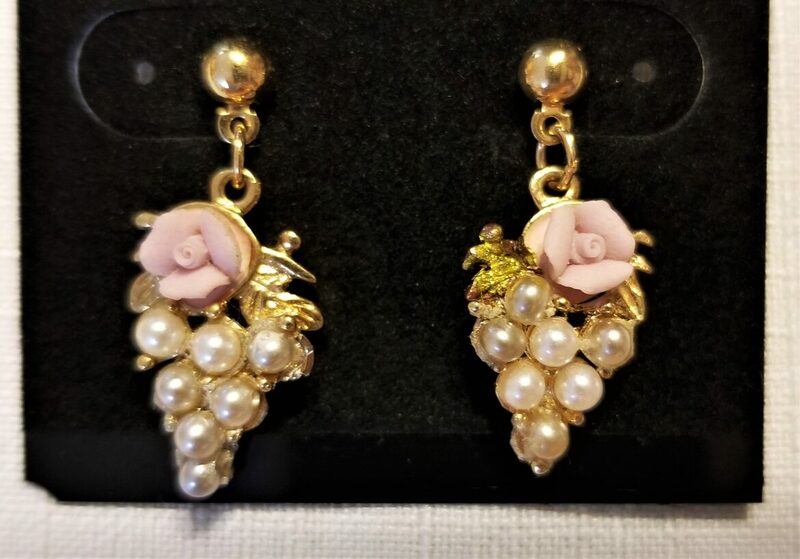 These earrings are very classy. 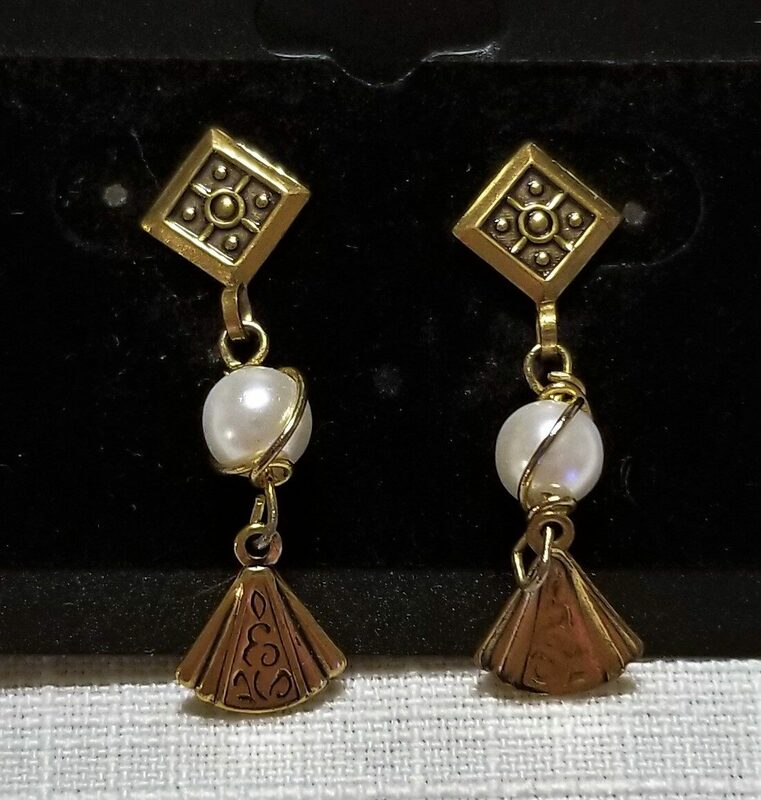 Damascene accents and they feature a pearl in the drop. 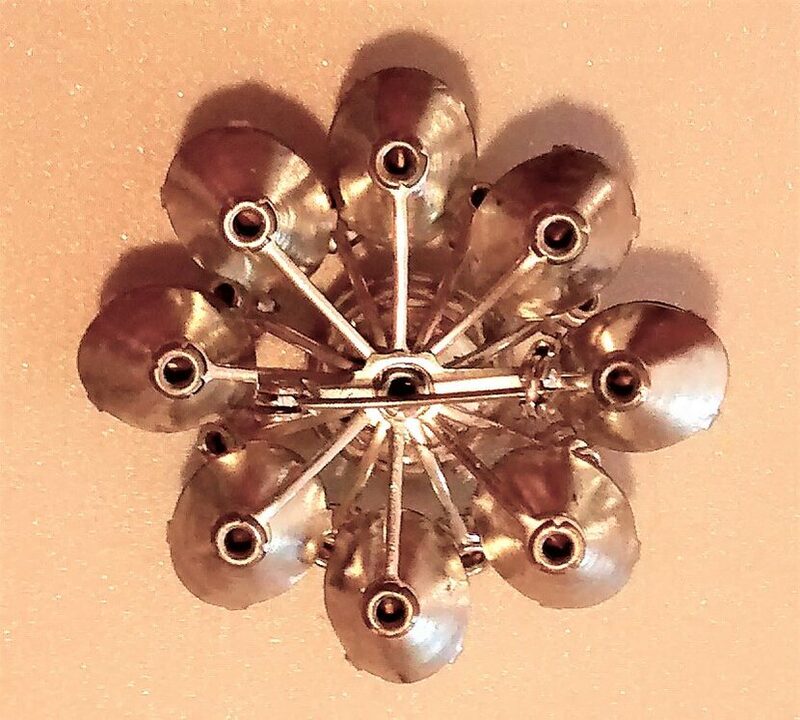 They are dainty and very pretty and are ready for a dressy occasion. 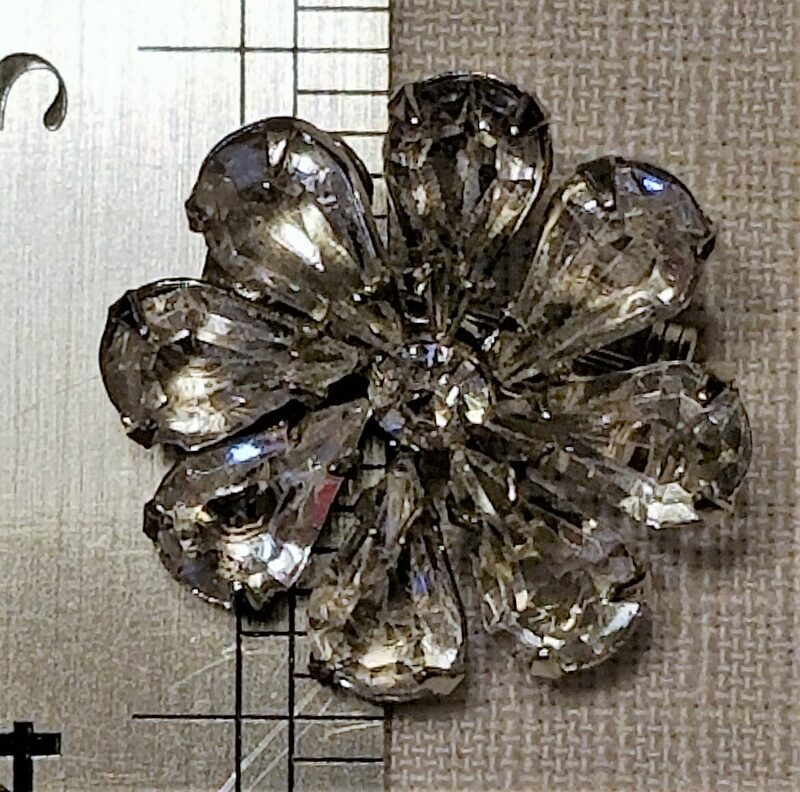 Dimension is 1 1/2" length and 7/8" width. 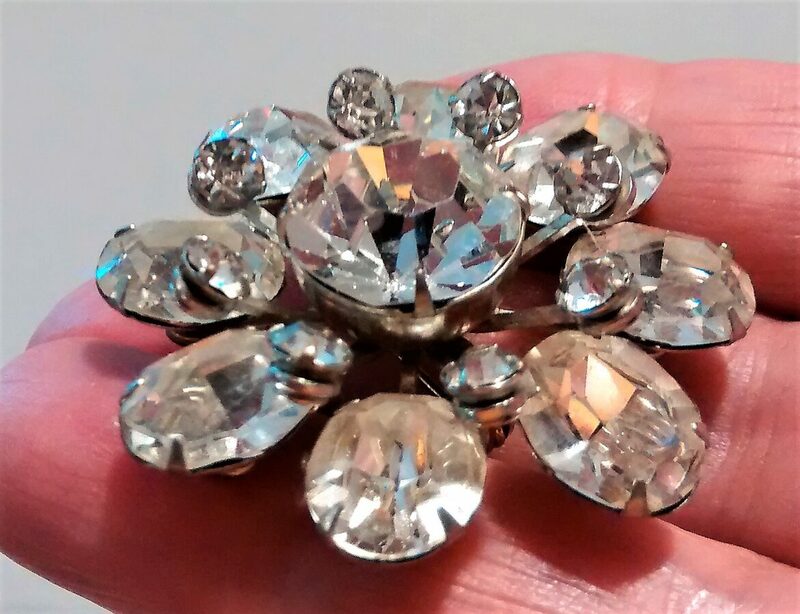 Based on the riveted back, this is a vintage rhinestone brooch/pin from the 1950s to 1960s. 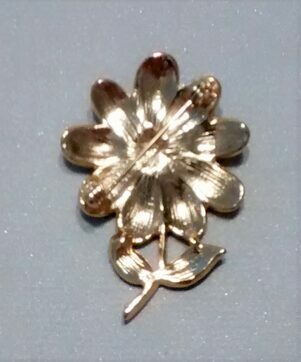 It is a lovely floral design with a layer of small rhinestones all around that adds a 3D look. Silver back. No name on the piece. Approx. 1 3/4 inches across. Please consult the pictures that are featured to help you judge the size and look. 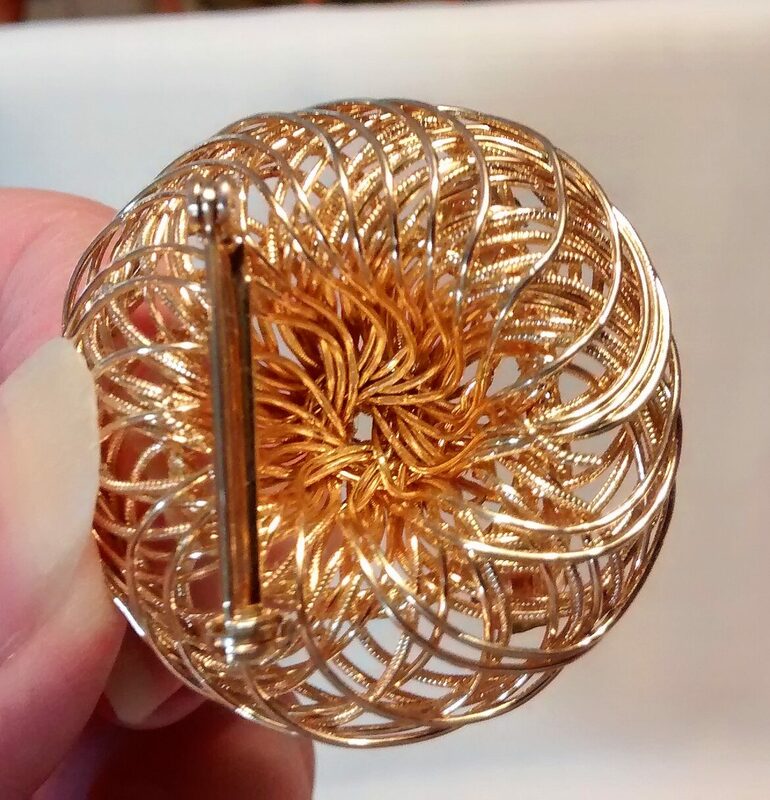 The back of the piece is shown in the last picture. 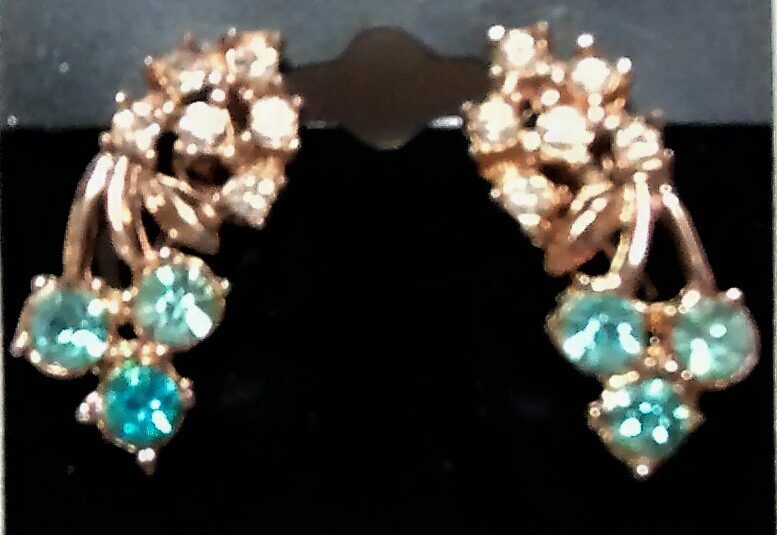 A scrumptious pair of vintage earrings that are of clear and teal rhinestone clusters in gold-tone setting. 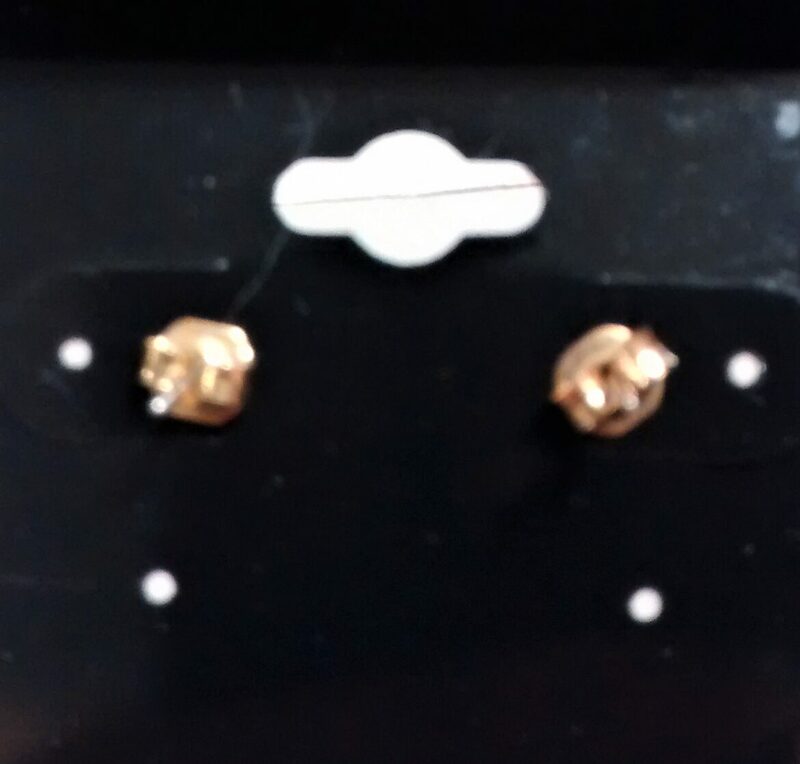 They are a an inch and a quarter in length and half-inch in width. Beautiful, cascading style. 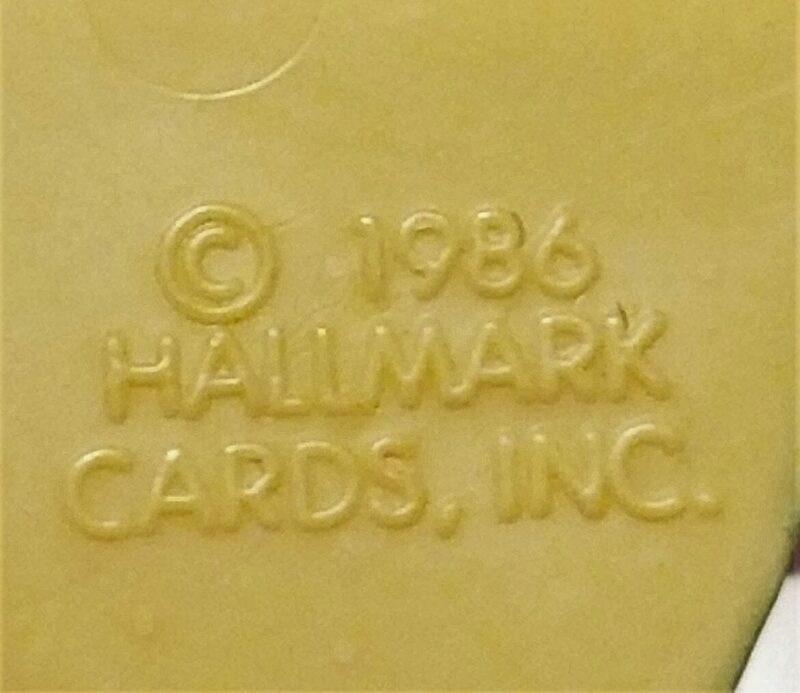 I have no idea when these were made, but I would guess in the 80s. 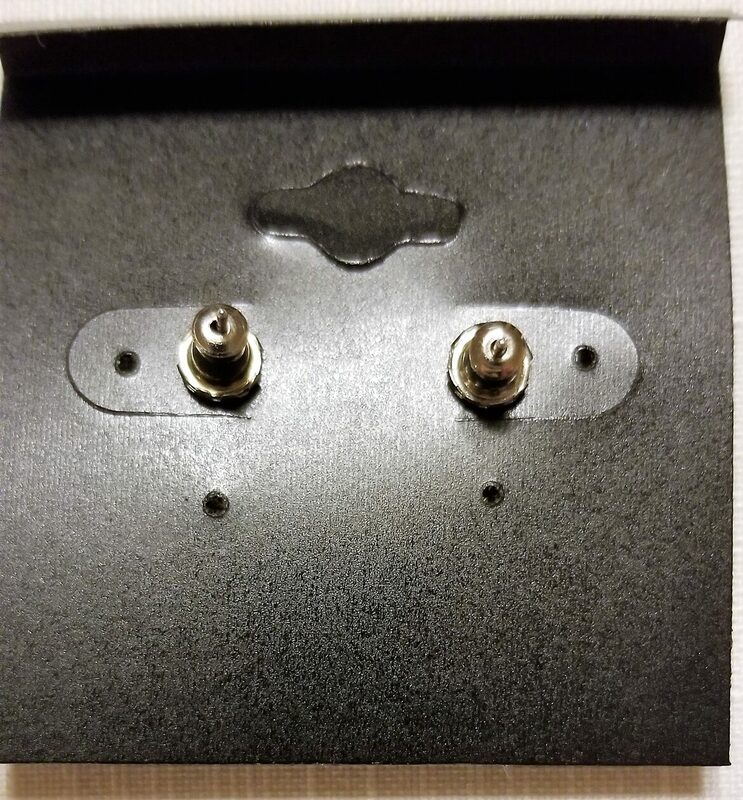 These have screw on backs. Great for a fancy night out. 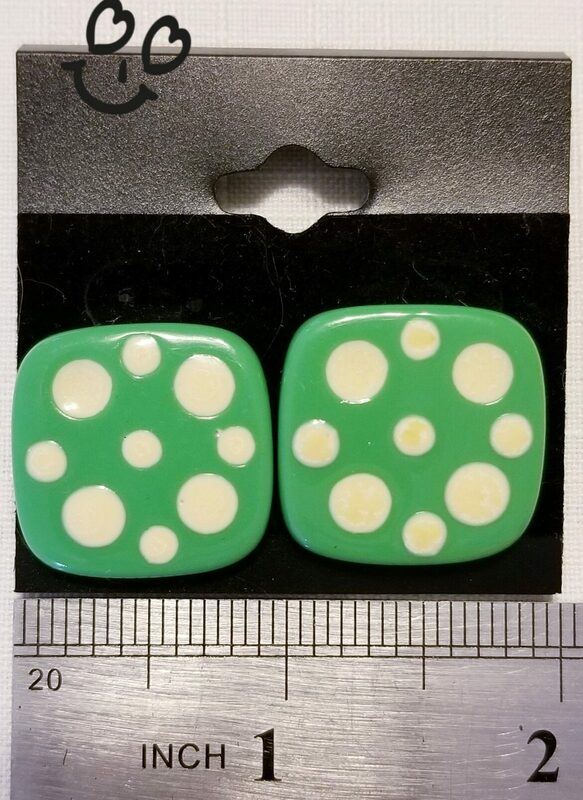 Cute pair of happy green earrings with white polka dots. They have that retro 50s look, but I think they were made in the 80s. Clip backs. Just add a poodle skirt. 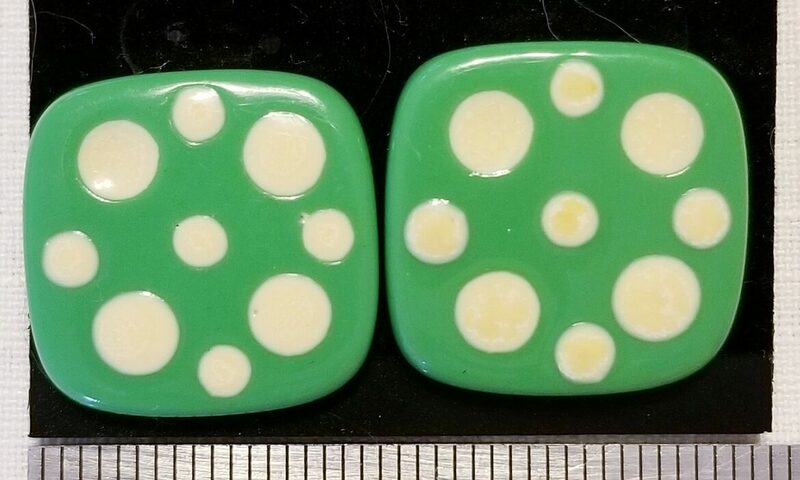 There is a bit of yellowing on the dots, but not very visible while wearing.